Looking back at last year…. We made a stir-fry last night with some of the greens from the garden: red kale, spinach, mizuna, mustard greens, and leeks. It’s not totally out of the ordinary to find these growing fairly well in a January garden around here. 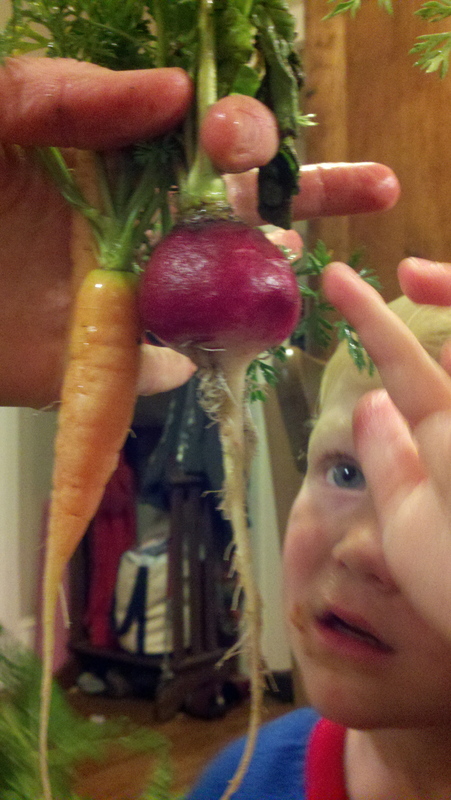 Unfortunately, the carrot was kind of anemic, and the radish tasted fine but the texture was lacy. And, along with the warmth comes the bugs — so not only did I bring in greens, but also a big brown caterpillar (boys loved checking him out) and a couple of bluish aphid colonies on the kale. End of summer veggies. Getting ready for fall food. Raised cedar bed kits — at the hardware store!